Our Core Values team carefully selected this value as one of our cornerstone core values because this word represents our company culture in many ways. 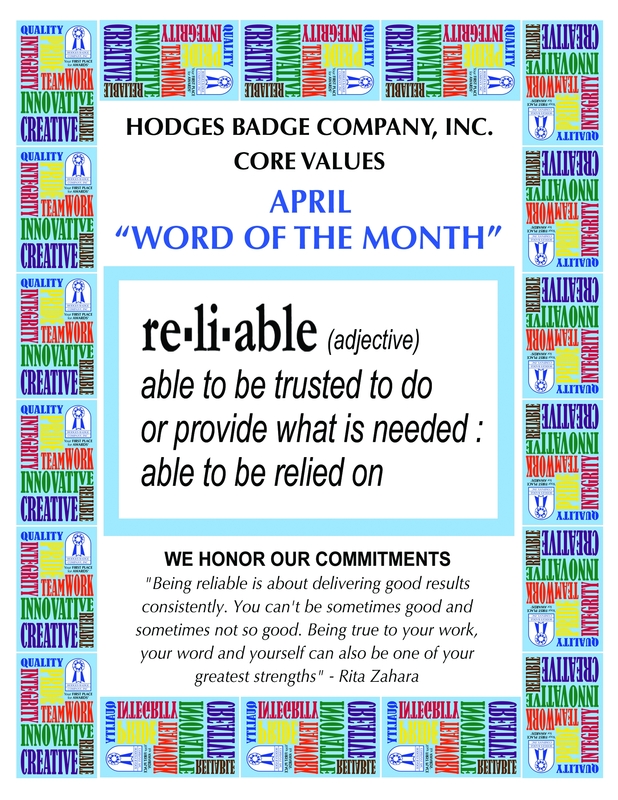 What does reliability mean to Hodges associates and our customers? You can rely on Hodges to deliver your awards on time for your event. We realize that your awards are critical to the success of your event and how important it is to deliver your awards to you on time to give you the time you need to receive your awards and relax a little before your event, knowing you have one less thing to worry about. You can rely on Hodges for quality custom awards that you will be proud to award for presentation at any event or occasion. Pretty good isn’t very good at all. It needs to be the best it can possibly be. We work as a team the minute we get your order to meet or exceed industry standards and inspect our products every step of the manufacturing and packing process. You can rely on Hodges to be experienced and professional in how we handle your order from start to finish. Great customer service extends well beyond the Customer Service department to the Art department, Manufacturing, Shipping, and Accounting. Your order will be processed and manufactured by employees that have years of experience and the training to create exceptional awards. Many of our Manufacturing employees have over 15 years of experience with Hodges. You can rely on Hodges to keep our awards affordable. We have been practicing “Lean manufacturing” for over 10 years, and are fanatical about reducing waste and increasing value. Lean manufacturing has increased our reliability and helped us keep our awards very competitively priced. A tip for celebrating your core values: Keep you core values visible and engage as many of your teammates as possible in your core values discussion – Use horizontal tape top ribbons to display your core values message.